A European Commission strategic plan wants to see 20% penetration of wind energy throughout the EU by 2020. The growing trend for decentralised energy generation by home and business owners could help meet this target using small and medium turbines. But they continue to divide opinion due to noise and health concerns. Opponents to wind turbines often claim that the noise and vibrations from the turbines affect their health, leading to sleep disturbance, headaches and a host of other problems. But is this backed up by evidence or a good example of the nocebo effect? Igho Onakpoya, a medical doctor carrying out research at the Centre for Evidence Based Medicine at the University of Oxford, conducted a review of health and wind turbines, including 8 studies and 2,433 participants. Some evidence of health disturbance was found. “The higher the exposure, the higher the tendency for sleep disturbance,” says Onakpoya. However, he points out that the studies included were not designed to robustly link cause and effect and all had moderate quality of reporting. Another drawback is that “almost all of the outcomes measured in these studies are subjective, you can’t really be sure that the exposure is causing the particular symptom,” he says. Scientists say that turbine noise levels can depend on environmental conditions such as terrain and atmosphere, and also on the turbine design and functioning. Henry Rice, professor of Mechanical and Manufacturing Engineering at Trinity College Dublin explains that the noise from small wind turbines is different to that of large turbines, because the blade speed through the air is slower. “The noise spreads differently and has a different nature. The pulsations aren’t as directional” he says, adding that most of the previous work in this area has concentrated on large wind turbines. So what can be done to reduce noise? “You can change the profile, shape and tips of the blades, and the speed at which they turn,” says Rice. His team’s computer modelling of noise informed the design of three prototype turbines which will be built and tested in the coming year under the European project SWIP. 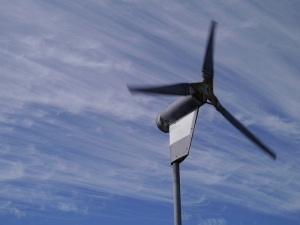 The consortium is reworking small wind turbines to reduce noise, turbulence and vibration, with a view to increasing their use in urban areas. Given the different nature of the sound produced by small wind turbines, more research and investment in noise reduction technologies in these designs needs to be carried out if such turbines are to be used in urban areas. The international standard IEC61400 regulates wind turbines, and several countries such as the UK and US have additional national guidelines governing their use. “The problem is that most small wind turbines aren’t certified,” says Koen Broess, who is an innovation consultant at DVN GL, Netherlands, and partner of the research project as well. “This is because production is limited and certification can be expensive. This is one of the barriers”, he adds. Technological advances can help small to medium wind turbines to be more acceptable, even if wind turbines face stiff competition from solar panels.